This morning woken by the sun, and by an incoming text message that urged paragliding students (and instructors) to come to Nummela airfield asap. Before 11 we had a nice crowd there. Initially the wind was very cross and some low fog clouds prevented us from towing but gradually the sky cleared out a bit and the wind turned South, and the towing could begin! 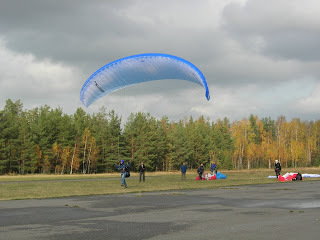 I actually encountered buoyant air and even some small patches of lift, nice! Once I landed I noted that all gliders present were from Ozone, so it looked as if we had some special event going on. I'd to leave early to fetch some scouts from a weekend event but I'm sure everybody got a couple of tows in nice conditions.